Abandon yourself to the spell of six short stories filled with thrills and dark suspense. 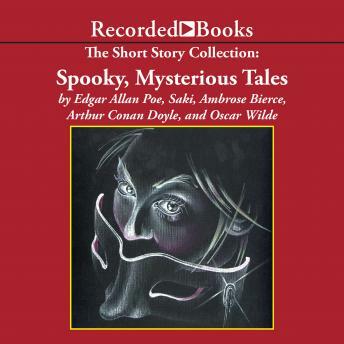 Here are tales by the masters of mystery and horror-- A. Conan Doyle, Edgar Allan Poe, Saki, Oscar Wilde and Ambrose Bierce-- taking on a new energy and force through performances by Recorded Books' critically-acclaimed narrators. Ranging from dungeons to drawing rooms, and peopled with extraordinary ghouls and doomed dowagers, the tales are guaranteed to raise the hair on the back of your neck. Our unabridged audioproduction may not be your first encounter with these stories, but the power of the narrations will make it a memorable one. Includes - The Tell-Tale Heart by Edgar Allan Poe; Shredni Vashtar by SakiTape One, The Open Window by Saki; The Damned Thing by Ambrose Bierce, The Adventure of the Speckled Band by A.Conan Doyle, The Canterville Ghost by Oscar Wilde.